The French bulldog is a small breed of domestic dog, related to the English bulldog and American bulldog. There are many conflicting references as to the origin of the French Bulldog. Some breeders claim the origin can be traced to Britain during the advent of the industrial revolution. The theory is that as mechanisation spread, the lacemakers of Nottingham, some of whom had been breeding toy or miniature bulldogs, were pushed out of their jobs. Many left England for Brittany and France where their skills were in demand. They took with them some of these small bulldogs, many of which had bat (upright) ears. This new style of dog appealed to the French and demand increased so much that breeders began breeding up the 'French style' to supply the demand in Paris. The breed became popular in England in the 1900s and then in America as Americans in Paris fell in love with them and took them home. Breeders say the French Bulldog has been in Australia since the late 1940s and was developed from imported English bloodlines. The head should be large and square. The top of the skull should be flat but slightly rounded. The stop should be well defined, causing a hollow or groove between the eyes. Muzzle should be broad, deep, and well laid back; The muscles of the cheeks well developed. The nose should be extremely short; Nostrils broad with well defined line between them. The nose and flews should be black, except in the case of the lighter-coloured , dogs, where a lighter colour of nose is acceptable. The flews should be thick and broad, hanging over the lower jaw at the sides, meeting the underlip in front and covering the teeth which should not be seen when , the mouth is closed. The underjaw should be deep, square, broad, undershot, and well turned up. Eyes should be wide apart, set low down in the skull, as far from the ears as possible, round in form, of moderate size, neither sunken or bulging, and in colour dark. No haw and no white of the eye showing when looking forward. Ears shall hereafter be known as the bat ear, broad at the base, elongated, with round top, set high in the head, but not too close together, and carried erect with the orifice to the front. The leather of the ear fine and soft. The tail should be either straight or screwed (but not curly) , short, hung V low, thick root and fine tip; carried low in repose. 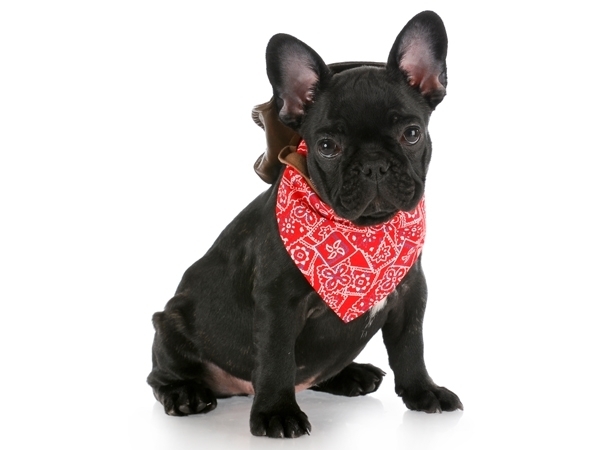 The French Bulldog, like many other companion dog breeds require close contact with humans. They have fairly minimal exercise needs, but do require at least daily walks. As a flat-faced breed, it is essential that owners understand that French Bulldogs cannot live outdoors. Their bulk and their compromised breathing system makes it impossible for them to regulate their temperature efficiently. In addition, Frenchies are top heavy and therefore have a difficult time swimming. Precautions must be taken when exercising a Frenchie during hot or humid weather, as well. French Bulldogs are very sweet and an excellent companion. The French Bulldog rarely barks and if he does its often to draw attention, to point that he needs something or just because he is not happy. This breed is patient and affectionate with his owners, especially with children, who are especially protected by the females. French Bulldogs can easily live with other breeds when the proper introductions are done. As a result of the compacted airway of the French bulldog, they may develop an inability to effectively regulate temperature. While a regular canine may suffer to some degree from the heat, to a Frenchie it may be lethal. It is imperative that they be protected from temperature extremes at all times, and that they always have access to fresh water and shade. French bulldogs can also suffer from an assortment of back and spinal diseases, most of which are probably related to the fact that they were selectively chosen from the dwarf examples of the bulldog breed. This condition is also referred to as chondrodysplasia. Some breeders feel that only dogs that have been x-rayed and checked for spinal anomalies should be bred from.